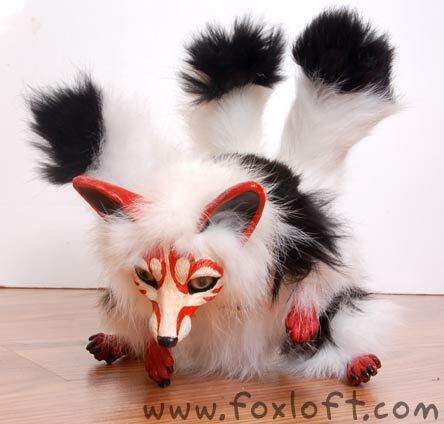 Kabuki is a little kitsune, a mischievous spirit full of inquisitive energy. He enjoys brushpainting, dancing, and playing the mandolin. He considers himself a purveyor of the finer things in life and enjoys reading about ancient history. 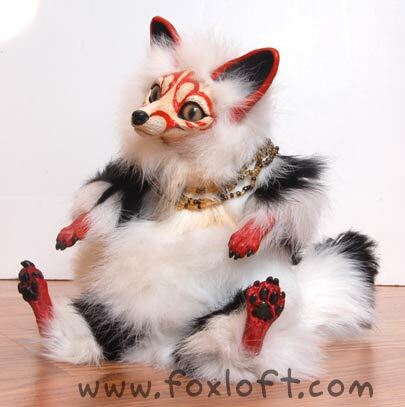 Kabuki is a one-of-a-kind handmade soft art doll. He is approximately 6" high x 6" wide, not including his three fluffy tails. He is made from natural rabbit fur (sustainably harvested) and is very soft and wonderful to pet. He has hand-painted glass eyes and durable, cast, sculpted resin face, ears, and feet that have been lovingly hand-painted and detailed. 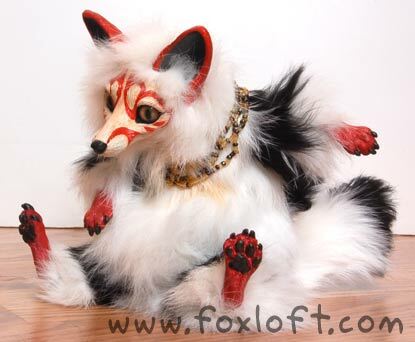 His body is weighted but still very light and includes an armature that is gently pose-able. Kabuki is a piece of art, not a toy, and not meant for small children. Each of my dolls comes with a hand-signed tag and a numbered certificate of authenticity, making it a collectible, OOAK work of art! Get notified when new art dolls are available! View glyph pendants for sale!